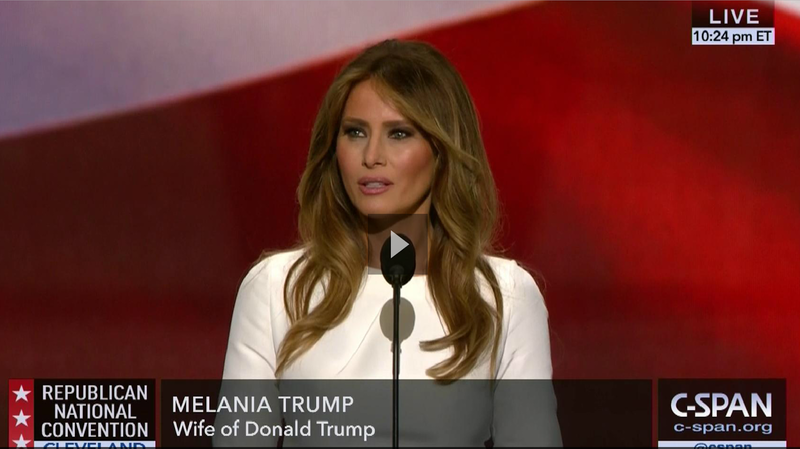 The most famous speech of many given in this week of the U.S. Republican National Convention was a woman's speech. At the beginning of the week, that was because it was only the second speech given in the presidential campaign by Melania Trump, wife of candidate Donald Trump. Speculation was natural. By the end of the week, a woman speaker and a woman speechwriter both had been prominently discredited, and the message of the speech completely lost in a plagiarism furor. From a young age, my parents impressed on me the values that you work hard for what you want in life; that your word is your bond and you do what you say and keep your promise; that you treat people with respect. You work hard for what you want in life; that your word is your bond and you do what you say you’re going to do; that you treat people with dignity and respect, even if you don’t know them, and even if you don’t agree with them. Similarities can be found with other passages as well. If anyone at the Trump campaign had thought to themselves, "Oh, no one will notice," they were quickly proved wrong. A Twitter user and former television journalist tweeted about the similarities. Huffington Post was among the first to report on the possibility of plagiarism. Mainstream media pundits called it a "catastrophic" occurrence, and at least one suggested it was sabotage from within the campaign. Others said it just showed the amateurish nature of the campaign. Twitter exploded. The campaign itself poured fuel on the fire with conflicting statements. Before the convention, Melania Trump had told at least one media outlet that she had written the speech herself "with as little help as possible." After it was brought to light, the campaign issued a statement about the speech that did not address the plagiarism, but talked about her "team of writers" using her own thoughts among other sources. But the next day, Paul Manafort, the campaign's chairman, denied the accusations, saying, “There’s no cribbing of Michelle Obama’s speech. These were common words and values that she cares about — her family, things like that. I mean, she was speaking in front of 35 million people last night. She knew that. To think that she would be cribbing Michelle Obama’s words is crazy.” Others in the party had a variety of reactions: fire the speechwriter, the plagiarism wasn't a big deal, and, bizarrely, that the backlash was Hillary Clinton's way of blaming a woman who attacked her. That mix of responses led to more investigation by reporters. They put the speech through a plagiarism checker (pro tip: there are many freely available online) and found nearly 50 percent of it qualified as "non-unique," despite New Jersey Governor Chris Christie's assertion that "93 percent" was original. With the longest matching phrase at 23 words, the report noted that the likelihood it was a coincidence was less than one in 1 trillion. Side-by-side video comparisons of the two speeches, and videos that overlaid the two speeches, were rushed online. Every speechwriter dreams of a speech being pored over in detail, each word considered...but not this way. The reality was closer to Trump's original statement. A speech had been commissioned from two top Republican speechwriters, who were quick to share their draft and note how little it had in common with the eventual speech. It emerged that Trump had worked with a trusted ghostwriter to edit the original draft, and finally, that ghostwriter, Meredith McIver, admitted responsibility for incorporating Michelle Obama's words and failing to remove them from the draft. As MSNBC pointed out, every Republican who had fallen in line with the campaign's denial was suddenly left looking stupid, or out of the loop. And, credibility being in short supply, observers noted that McIver's social profiles had all been created fewer than 24 hours before the disclosure, prompting speculation that the speechwriter is not real. But in fact, she does exist, and in the past, had another episode in which she entered errors into a book manuscript for Donald Trump. Because she is not registered as working for the campaign, her involvement may be an illegal in-kind contribution to the campaign. All that for using a writer with whom (I'm guessing) the candidate and his wife feel comfortable. Authenticity goes beyond facts: When I watched the speech delivered live, the "your word is your bond" speech struck me as inauthentic to Trump. To my ear, the phrasing didn't seem like something she would say herself. Copying, rather than just consulting, previous speeches is a mistake just waiting to be discovered. More important, a speech needs to fit you like a glove, not be a speech that someone else could deliver. The copied version could only be, at best, an ill-fitting glove for Trump. Sarah Palin faced a similar situation, with a convention speech pre-written long before anyone had selected her. But it was customized with stories from her personal life that fit the themes, a much better way to make it her own. Don't miss your big opportunity: Controversy aside, this speech missed the mark by a mile. The speaker didn't practice, saying she only read the draft once over before delivering it. That meant she was reduced to reading the teleprompter instead of reaching the audience. Some observers excused the flat delivery by saying English is not Trump's first language, but she speaks five languages. That wasn't the problem. The content did nothing to help us know and understand her husband in ways only she could share, which is the entire point of having a candidate's spouse speak. Pundits were reduced to commenting on her appearance and that her delivery was serviceable, because the content and genuine connection were so lacking. Use the Russert test: The late journalist Tim Russert had a great test for inauthentic-sounding statements: Take your talking points and turn them into pointed questions that your worst enemy would ask, to see if they stand up. Hard, skeptical questioning might have uncovered such problems as using the lines of the opposing party's First Lady, praising your husband's loyalty when you're his third wife, and challenging the opponent's authenticity with a speech that is plagiarized. The Russert test helps you attend to the details on which your credibility is resting. After all, it's not how you see the speech that counts. It's how we see it. Details matter: Details matter in high-profile talks like this one. The controversy meant that Melania Trump's words really didn't get heard, drowning out her message more effectively than any mute button. Once the error was confessed, her husband's campaign shared its plans to scrub his speech for the same kinds of errors and copies that no one bothered to look for in his wife's speech. Apparently, they know how to do this. They just didn't do it at any point in the prep for Mrs. Trump's speech. There's no better indicator of the negative impact of this speech than this: Over the four days of the convention, this plagiarism scandal overwhelmingly dominated the media coverage, even prompting reporters to examine how the candidate's speech was being fact-checked in advance. No matter how you vote, I think it's a shame that this happened to a woman speaker on only her second speech of the campaign. The Republican National Convention had just 34% female speakers on the stage, with this speech the most prominent by a woman. I'm ending the week feeling as if Melania Trump was not, at a minimum, well supported for this now-famous speech, in both the speech preparation and the spokesmanship about the controversy. In the end, this major stumble at what might have been the start of a high-profile speaking career is going to dog her steps going forward. Should she become First Lady, she might well want to avoid speaking publicly, which would be a big step backward for that role. This will frame her media coverage and her credibility. Her unfavorable rating was high going into the convention, and it will only increase now. And it should. In the end, the responsibility for a speech begins and ends with the speaker, no matter how many speechwriters you throw under the bus.